Dr Alessandra Conversi helps pull together comprehensive overview of changes in the global marine ecosystem. An associate researcher within Plymouth University’s Marine Institute has played a lead role in pulling together an innovative and comprehensive overview of changes in the global marine ecosystem. Dr Alessandra Conversi, Italian Consiglio Nazionale delle Ricerche senior scientist, was the lead editor, in collaboration with Christian Möllmann, Martin Edwards and Carl Folke, of a special themed edition of the prestigious journal Philosophical Transactions of the Royal Society B*, featuring the perspectives of 80 authors from different disciplines and across six continents on marine regime shifts. Regime shifts are dramatic, abrupt changes in ecosystem structure and function that have been reported worldwide in the marine realm. 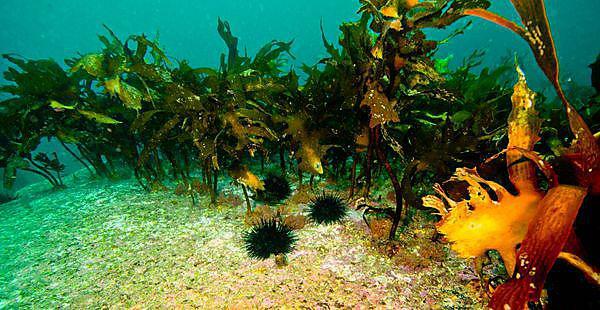 Such shifts can carry significant socio-economic impacts, for example when they involve the collapse of fisheries, coral reef degradation or the overgrazing of kelp beds. The journal publishes a number of new studies addressing regime shifts from the different perspectives of theory, ecosystem observations, modelling and management, such as a look at potential future impacts of a warming sea on coral reef ecosystems by simulating the response of corals in the Caribbean to a climate change scenario for the next 50 years, and the role the Soviet Union’s fishing activity may have had in marine shifts in the Baltic, Black Seas and Scotian Shelf. Alessandra co-wrote the leader piece Marine regime shifts around the globe: theory, drivers and impacts, the issue’s synthesis A holistic view of marine regime shifts, and the paper Synchronous marine pelagic regime shifts in the Northern Hemisphere. In the latter paper (by Beaugrand et al), written in collaboration with researchers at organisations including the University of Science and Technology at Lille, the Sir Alister Hardy Foundation for Ocean Science, and the Universities of Stockholm, Hamburg and Washington, the authors examined whether regime shifts observed in 11 marine systems from two oceans and three regional seas in the northern hemisphere were synchronous, applying the same methodology to all. Their analyses indicate that temperature, together with atmospheric circulation, can be the synchronizing agents behind the the late 80s regime shifts. New scenarios could incorporate synchronous ecosystem responses. "Despite numerous studies showing the importance and actuality of these shifts, major questions are still unsolved and there is still no common understanding of the drivers, mechanisms and characteristics of abrupt changes in real marine ecosystems," said Alessandra. "However, the knowledge derived from this collective work indicates that regime shifts are in most cases triggered by multiple factors which contribute synergistically, often in time-delayed mode, to erode the resilience of the ecosystem. This in turn suggests that future studies should involve multiple stressors and analysis of resilience."